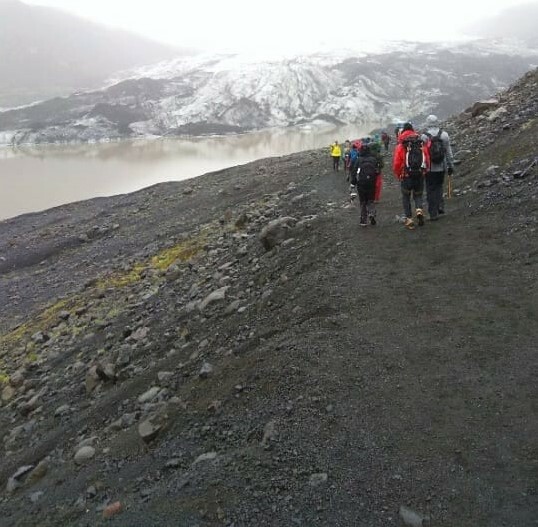 Yes, you read that right today we hiked up Sólheimajökull glacier in the south of Iceland. After traveling yesterday and staying in Vik, we woke up this morning to the most delightful breakfast. Waffles, fresh warm bread, Icelandic cheese infused butter and smoked trout, with freshly squeezed orange and apple juice was the smell that filled our small hostel here in Vik. Scrambling to get our stuff together, we left Vik at “08:45” on our way to the glacier 45 minutes away, all the while listening to some jamming music from our co-leader of the day Emi. Arriving at the foot of the glacier we met Gummi and Oddur who helped fit us with crampons and ice axes to look awesome but also to be safe. 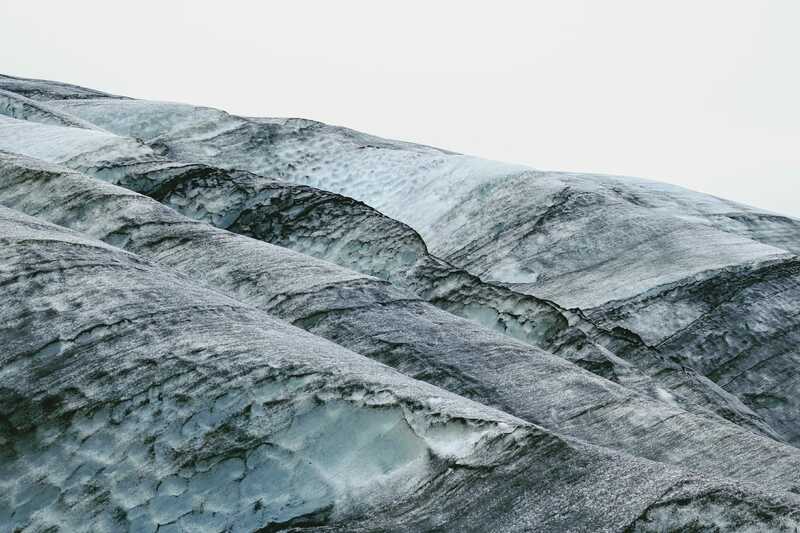 We hiked a brief distance where we put on our crampons and went through some safety briefings, learning how to walk on the glacier, what not to do and the best places to enjoy its beauty. Then, we started hiking, first together as a full group to get onto the glacier itself and then we split into two, heading in opposite directions around the glacier. 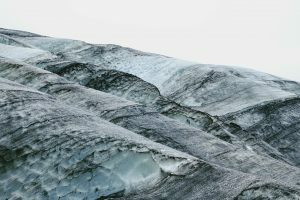 Sólheimajökull is an outlet glacier of the mighty icecap of Mýrdalsjökull and though it is one of the most easily accessible glaciers it is still a difficult climb. Being about 8 km long and 2 km wide, Sólheimajökull is blanketed in ash spots from the eruption of Eyjafjallajökull in 2010 leading there to be black areas all over the glacier, making the most beautiful contrast. 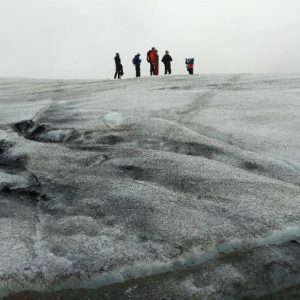 We pushed onto the lower part of the glacier, walking around the deepest crevasses which extended as far down as the eyes can see, as rain and melt water poured into them. The small streams on the glacier were so fresh that we all stopped to fill out bottles with the purest and freshest water we had ever tasted. 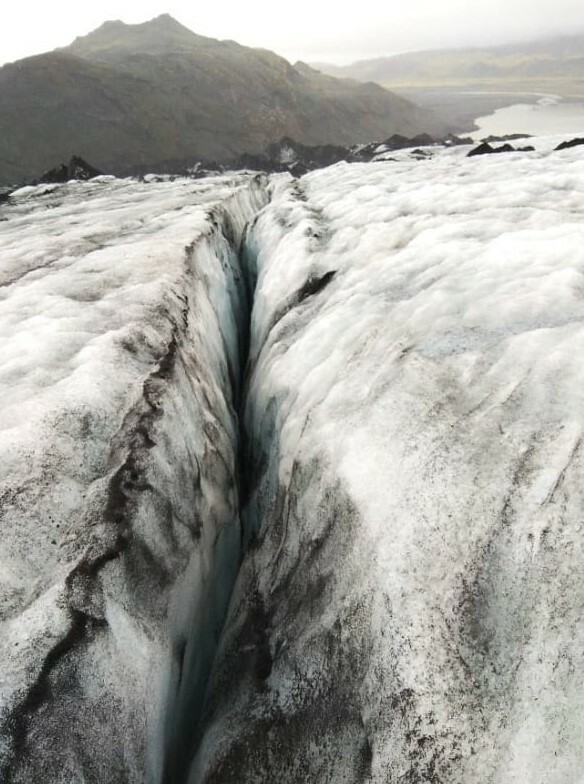 Spots on the glacier covered by ash at points where higher than the surrounding ice as the ash insolated ice preventing it from melting and the most majestic waterfall could be seen on the left side of the glacier. Having a brief lunch at a high point on the glacier, we froze our butts as we sat on the 1000-year-old ice and ate our packed sandwiches, drinking Iceland’s purest water. We then hiked back down the glacier taking a different route. The sound of out axes and crampons slamming into the ice as we descended the beautiful Sólheimajökull glacier is something I know we will all remember.